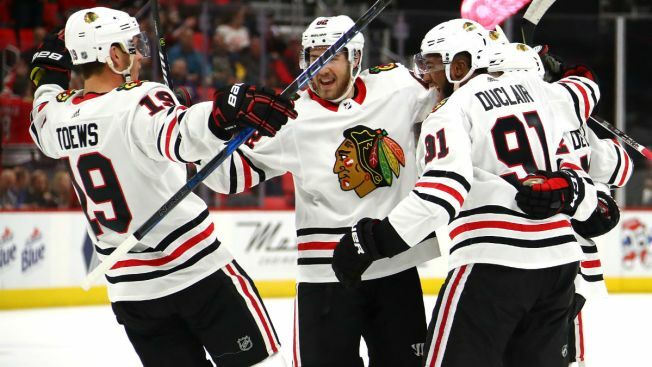 Alex DeBrincat had his second hat trick of an impressive rookie season and the Chicago Blackhawks chased Detroit goalie Jimmy Howard in the first period on their way to a 5-1 victory over the Red Wings on Thursday night. DeBrincat, Anthony Duclair and Vinnie Hinostroza scored in the first 8:47 before Howard was pulled, and the Red Wings never got back in the game. DeBrincat added another goal in the second period and scored an empty-netter in the third, bringing his season total to 17. Anton Forsberg came within 3:51 of his first career shutout before Anthony Mantha scored for Detroit. DeBrincat opened the scoring after just 3:19 when he wheeled around and shot from near the top of the right circle. With Chicago's Jonathan Toews creating traffic in front, the puck went past Howard for a 1-0 lead. Duclair made it 2-0 with a shot from the high slot. Then Hinostroza came in on a 2-on-1 and decided to shoot himself, beating Howard to give Chicago a three-goal advantage. Howard headed to the bench after making only six saves, and Petr Mrazek replaced him. Detroit's Gustav Nyquist hit the post shortly after the Red Wings fell behind 3-0, but Detroit didn't create much sustained pressure, even though it was Chicago that had played the night before. The Blackhawks had lost four in a row and are in last place in the Central Division, but after going just 1-4-1 on a six-game homestand, Chicago heads into the All-Star break on a better note with the win at Detroit. Forsberg was closing in on a shutout in his 27th career game, but Mantha redirected a pass from Henrik Zetterberg into the net. Zetterberg moved into a tie with Pavel Datsyuk for fifth place on Detroit's career assists list with No. 604. The Red Wings pulled their goalie at the end, and that gave DeBrincat an opportunity to shoot into the open net in the final minute.